1964 is a significant date in the newly entwined stories of Lusaka and The Hussar Grill. 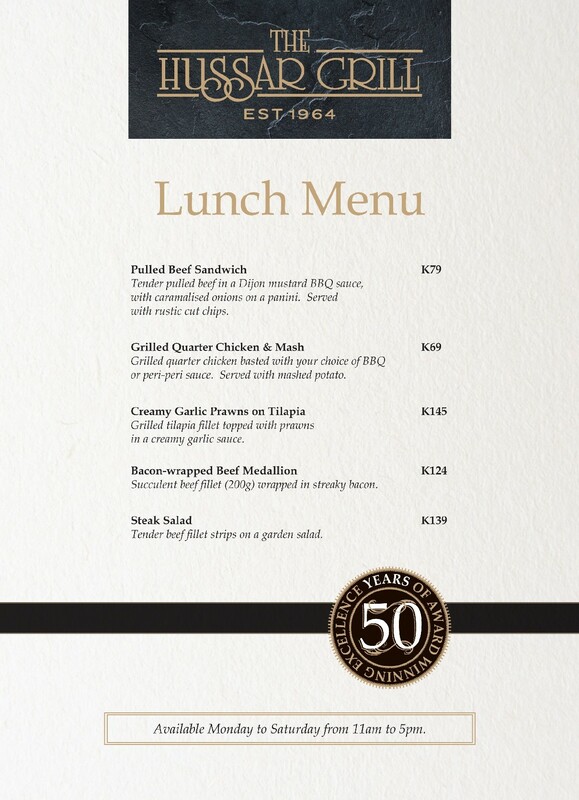 It is the founding year of the Hussar Grill in Rondebosch, Cape Town, as well as the somewhat more momentous occasion of the Zambian Independence and the naming of Lusaka as capital city. Step forward in time 55+ years to find Lusaka as the fastest growing city in Africa, with the need for distinguished and elegant culinary retreats surely at its peak. Some would call the timing of our Lusaka Grill Room opening impeccable – we prefer to reserve the word for our specialty steaks, service and celebrated wine list. Bon appétit! Good food, excellent atmosphere service is quite good, friendly people. Don't miss it. Chateaubriand is an excellent option and for dessert don't forget the house's special... Chocolate with vodka and martini. The food here is well prepared and presented. The staff are friendly and the wine selection was better than I expected. The hostess was very friendly and I would go back again especially with meat lovers. The decor at Hussar gives the feeling of being in an old school private club. Books on shelves and quality furnishings with a well stocked bar that did not intrude on the dining experience. Our server was very professional and competent. Right down to pairing room temperature water with red wine drinkers and cold water for the beer drinkers. Nice touch. The red meat dishes were cooked to order and delicious. Overall a great dining experience in a restaurant located in a suburban mall. "Yes there is good good in Lusaka"
Great Service and Food, be sure to go in good time as the place gets packed , preferably call and book to reserve a table especially on weekends.